SOF-SET™ is a semi-smooth, easily-applied, thread-sealing compound formulated with special ingredients to provide superior sealing to a variety of liquids and gases. 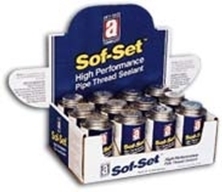 SOF-SET is non-petroleum based with a high-solids content that firms up after application to further promote a quality seal. Not for oxygen use. Applications: Threaded connections for water, steam, LP and natural gas, refrigerants, fuel oils, hydraulic oil, diluted acids, and caustics. Use on all metal and PVC threaded pipe connections found in industrial, commercial, and residential systems.